I have been an avid mountain biker for many years now. I spent my three years in Australia developing my skills in some amazing places like the You Yangs, Forrest and Stromlo. I then had the great fortune to ride in New Zealand around Queenstown and Rotorua before heading across to have some amazing experiences riding in Ecuador and Bolivia. I still love my home area in the north east and Hamsterley is my local area which I still love after all that. 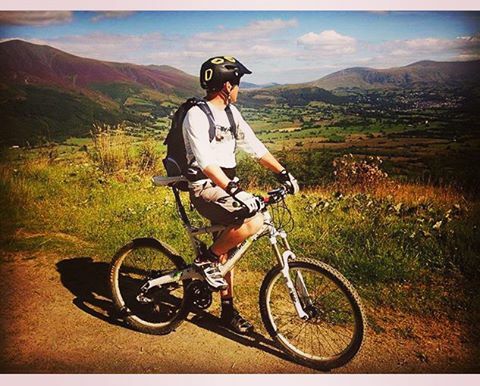 I have been a qualified mountain bike instructor since returning home and have managed to get out and ride across the UK. 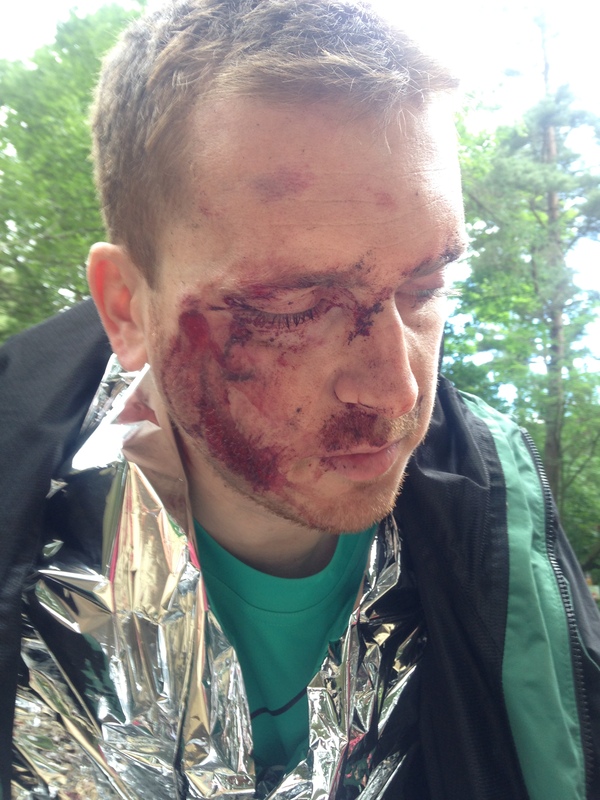 This summer I was involved in a serious crash while riding my local trails making a school boy error in scrubbing too much speed rolling into a jump. My front wheel dipped quickly and I went down hard. I woke up later and ended up in hospital. 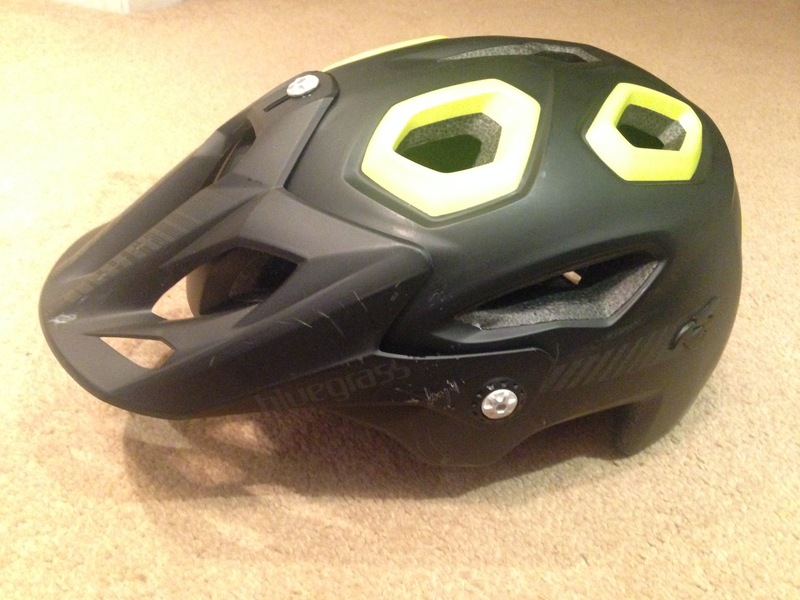 This is why I thought I’d be able to write a better review of this particular helmet, I used this and it’s not an understatement to say that it saved my life this summer. As with all helmets, once they have taken any kind of impact they need to be replaced as their integrity is compromised. I did look the helmet up again when going through my rehab but decided to go with another helmet that could protect my face too after ‘caving in my cheekbone’ in the words of my maxillofacial specialist. I’m not going to lie, since winning the best dressed male award at work and holding onto that awards for 4 years now, I do care about style. The Bluegrass Goldeneye certainly had a unique look which caught my eye in the first place. The helmets are stylish and come in a range of colours to suit your style (or coordinate with your ride!). 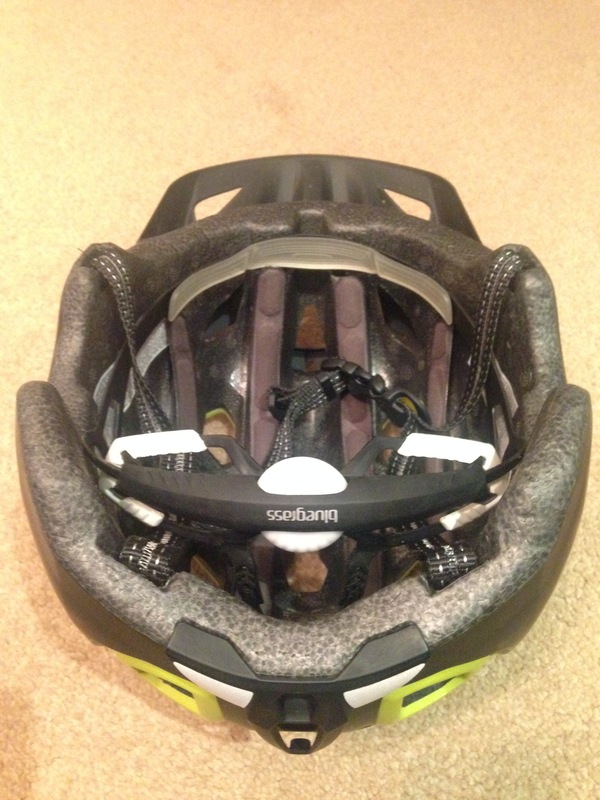 The adjustable visor looks good and is also very useful for sunlight, protection and mud due to its size. I did find the helmet quite bulky, much bigger than I was expecting actually although this wasn’t the case once riding. The size issue disappears with the lightweight nature of this helmet and the minimal weight is certainly a big plus in my opinion. Comfort was really high with this helmet for me, much more so than Fox and Giro helmets I’ve had in recent years. The broad contact area of the size adjuster made slight changes easy even when wearing thicker winter gloves. The gel pad across the forehead was particularly comfortable and very good in warmer conditions as it did not hold the sweat. Having ridden in Oz for so many years the old habits are difficult to shake and an obsession with a helmets venting is still there. The Goldeneye has 13 vents but some are very small so it can feel hot at times. The helmet was well priced at the start of 2015, at around £85, but in doing my research for the review I noticed it has come down a lot on most of the major websites. I would certainly recommend this helmet to the extent that this was the first helmet I looked at when replacing the original. Instead, I went for the Bell Super 2r Mips (which I will try and review asap) with the detachable face guard allowing it to go into full face protection when required due to the injuries earlier this year. ← Why bother walking in the countryside?